I feel the need to express our gratitude for the wonderful room at Millard Suburban hospital. Recently my fiance had very complicated lung surgery after suffering a collapsed lung multiple times. The past 45 days we had been in and out of the hospital for 7 - 10 days at a time. This final hospital stay, when the surgery actually occurred, she was fortunate enough to be placed in the "Anthony's Room" for the final 6 nights of her recovery. The accommodations, especially the Chinese symbolism, spoke very well to keeping her and our families spirits up. The comforting room no doubt played a major role in keeping her emotionally strong during the past nights. Her severe physical pain was eased by the comforting and welcoming feeling the room possessed. She is home now and recovering, but "Anthony's Room" helped making her long journey towards recovery less painful. Anthony's Room is truly making a difference in the lives of hospital patients suffering for any amount of time. Click here to read the article in the Buffalo News! 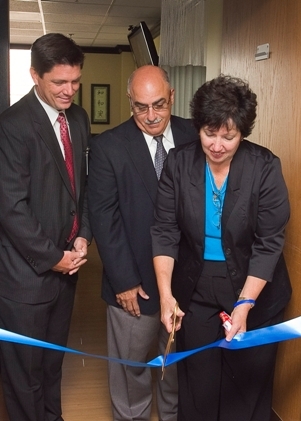 Cindy and Anthony Mannino along with Hospital President, Chris Lane at the ribbon cutting for Anthony’s Room. On Friday, Millard Fillmore Suburban Hospital unveiled “Anthony’s Room,” a dedicated hospital room for young adults dealing with cancer. The room is a partnership between Millard Fillmore Suburban Hospital and the Anthony V. Mannino Foundation (AVM) Inc. 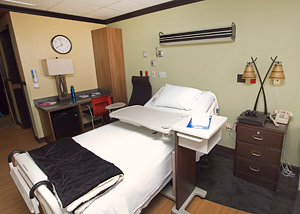 The room has been constructed and decorated with the primary focus on providing a calming atmosphere for both the patient and family during their stay. 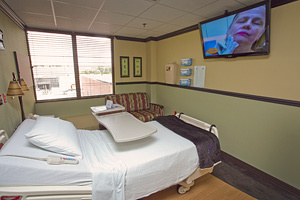 It has been outfitted with a flat screen TV, games, a sling box, WiFi capabilities, and special furniture to help accommodate the patient and a family member for overnight visits. Anthony V. Mannino passed away in March 2009 after a 22 month battle with esophageal cancer. Throughout his ordeal Mannino struggled with his care, as young adults end up as “tweeners” when dealing with cancer. Pediatric cancer patients, like their adult counter parts, have options when it comes to hematology and oncology care. Young adults, in the 18-28 range, often have clinical, financial, social and emotional needs that often go unmet. 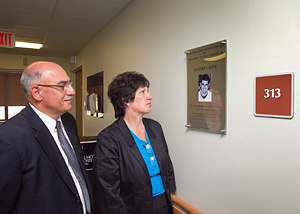 Friday's dedication was held on Mannino’s birthday. The Mission of The Anthony V. Mannino Foundation is to financially assist young adults in the age group of (18-28) while they are undergoing their cancer treatment. The Foundation is also aiming to develop support programs to aid this unique age group, with their special needs, as they battle cancer. They must stay a full time student to be enrolled in their parent's health insurance. Chemotherapy and radiation makes it impossible to feel well enough to take the four courses needed to be a full time student. Lack of psychological help and support. There wasn't a trained psychiatrist, specific to this age group, on staff at the hospital he was treated to help Anthony deal with his prognosis. Panic attacks, lack of sleep, night sweats, and lack of appetite are many of the side-effects of dealing with cancer at this age. There are fertility issues. It is important that the patient knows they have the opportunity to have a family. The option should be available to discuss storing their sperm/eggs. Psychologically, it gives the patient the hope they need to “fight” knowing they may still have the opportunity to have children in the future. This age group should not have to be part of the general population in the hospital. It isn't good for them, psychologically, to be placed with an older generation, or end-of-life patients, while they are receiving their treatment. There is a huge need for support groups, specific to this age group, and they should be made available, at the on-set of the diagnosis, to these courageous young adults. There is a need for financial support while this age group is undergoing their treatment. While Anthony Mannino had the full support of his family and friends, many young adults don't have that support. Often times, the young adult is away at college and their family isn’t readily available, or they are working a full time job and have to leave it during their treatment. There are tremendous costs to cancer and not every family or young adult has the means to afford all the costs that cancer brings.